As a parent you want your child to get the best possible start in their career. 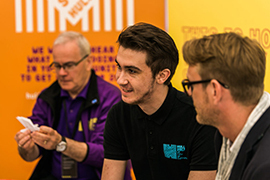 There are many options available to young people after they leave school, and here we outline information and benefits about apprenticeships as a key route into a successful career. What's an Apprenticeship and what are the benefits? It’s a real job, with real training, meaning you can earn while you learn and gain a nationally recognised qualification. Apprenticeships are now available up to degree level and beyond. Over 50 national universities are currently offering a range of degree apprenticeships with more to be confirmed throughout the year . All apprenticeships include elements of on the job and off the job training leading to industry recognised standards or qualifications. Some apprenticeships will require an assessment at the end of the programme to assess the apprentice`s ability and competence in their job role. The minimum wage for apprentices is £3.50** per hour, but many employers pay more than this. This is dependant on the sector, region and apprenticeship level e.g. some higher apprenticeships pay up to £500 per week. More details on salaries and entry criteria in specific apprenticeship occupations can be accessed by looking at the vacancies on ‘Find an apprenticeship’. Apprenticeships are available to anyone over the age of 16, living in England. There are different entry requirements depending on the sector and job. The government has stated that all young people must stay in some form of education or training until at least their 18th birthday. This does not necessarily mean staying in school, young people have a choice about how they continue in education or training post 16, which could be through an apprenticeship or traineeship. At any one time there are up to 28,000 apprenticeship vacancies available online in a variety of careers and industries across England. Visit gov.uk/apply-apprenticeship. You can search by keyword (job role, occupation type or apprenticeship level) and by location. Once the right job comes up, your son or daughter can simply register on the website and follow the step by step instructions to apply for the role.